Atlantic Bolt stocks a full line of structural bolts. We can provide domestic, Canadian and import structural connection bolts.Stock includes A325 & A490 structural bolts, F959 DTI/load indicator washers, ASTM F1852 tension control bolts, and ASTM F2280 tension control bolts. 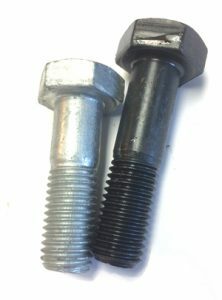 All bolts can be purchased in full keg quantity or packaged and tagged per your needs. 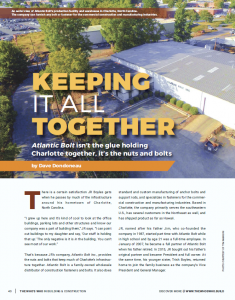 Lot tracing is a high priority at Atlantic Bolt. Certifications and test reports are provided free of charge upon request. ASTM A325 is most commonly specified for steel-to-steel connections, although ASTM A490 is equally available and can be specified when higher strength is desired. In either case, type 1 is the most commonly specified. Structural bolts require ASTM A563 grade C or DH nuts. ASTM A194 grade 2H nuts are also permitted as an alternative. ASTM F436 flat or beveled washers are used with structural bolts. Another option sometimes specified for use with structural bolts are ASTM F959 compressible-washer-type direct-tension indicator washers. These are commonly referred to as DTIs, load indicator washers, and, in the case of those with orange indicator gel, squirter washers. Twist-off-type connection bolts, commonly called TC bolts or tension control bolts, are sometimes specified to aid in the installation process. They feature a spline on the end that breaks off when the bolt reaches the correct tension. Note: these structural bolts require a special installation gun. They are sometimes referred to as A325 or A490 TC or tension control bolts, but their ASTM designations are F1852 and F2280, respectively.